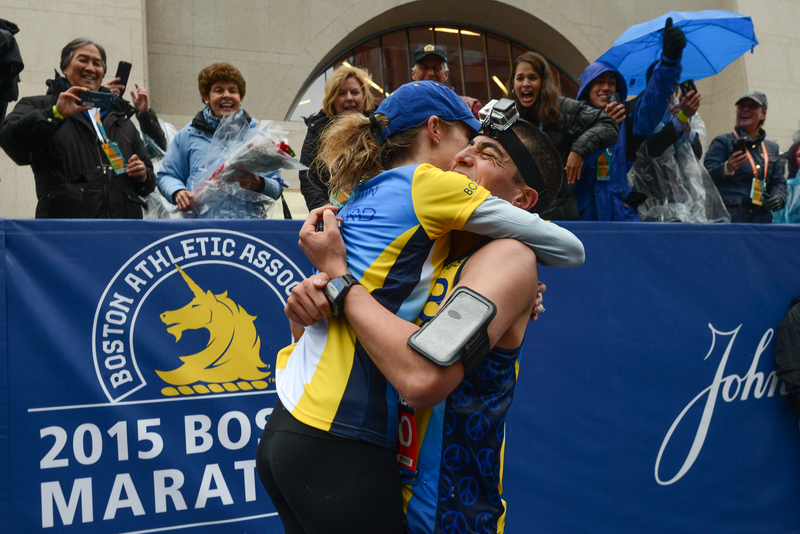 After nine months of planning, a breathless Daniel Koh, chief of staff to Boston Mayor Marty Walsh, proposed to girlfriend Amy Sennett at the finish line of the Boston Marathon on Monday. To make the proposal more personal, Koh asked the couple's friends to hold up signs along the last mile or so of the route, each with a different line from a poem he wrote for her. "I wrote a draft poem and after hours, had the Mayor's speechwriter give some edits," Koh, the former chief of staff to Arianna Huffington, told HuffPost. "Turns out, it was 12 lines so I found 12 friends who held up signs, one for each line." Koh first met Sennett, who works for the Boston 2024 Olympic bid, on their first day of Harvard Business School in 2009. "Each person introduced themselves and said one thing about him or her," Koh said. "I noticed this cute blonde girl say that she was an avid runner and was looking for a running buddy. I saw that as my in. 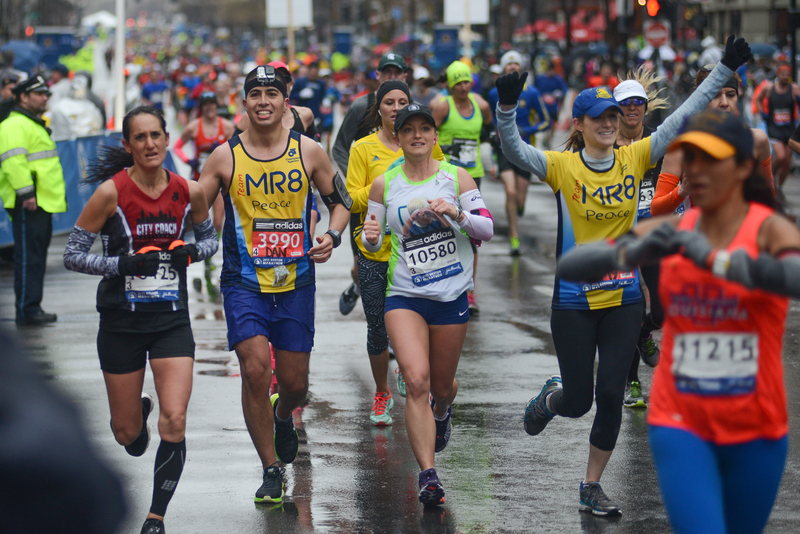 We'd go on 13-mile runs on weekends and with about two hours to kill each time, we got to know each other pretty fast." The proposal didn't go entirely as planned, though. For about 10 miles, Koh and Sennett couldn't find each other. He worried that she had run ahead of him and would cross the finish line without noticing the signs their friends were holding. "I stopped and tried to make calls in the rain with my hands pretty cold and my iPhone wet to those who were holding signs," he told HuffPost. "I managed to get through to one of my cousins who was holding a sign and told her to stop Amy if she saw her. Luckily, she did and she waited for me then." 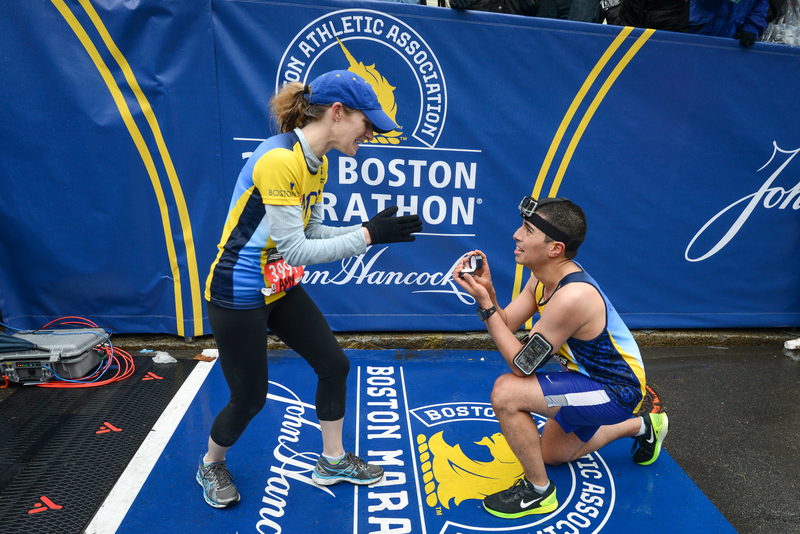 At the finish line, Koh quickly retrieved the engagement ring from his boss, Mayor Marty Walsh, who had been holding onto it. Koh then got down on bended knee to pop the question. Sennett, of course, gave a very enthusiastic "Yes!" Afterwards, the newly engaged couple went home, showered and spent the rest of the day with family and friends. Watch the GoPro video footage of the sweaty-but-sweet proposal above.